As the weather gets warmer, runners are able to shed some layers and should be prepared to sweat while they run. Not only will you have fewer pockets to carry personal items, you are going to need to hydrate more to combat the climbing temperatures, so you will need to find the best handheld water bottle for running. Make sure you have a high-quality water bottle that won’t leak and there are many new water bottles on the market that feature the latest in the best running water bottle innovations. Here are a few tips on what to look for in the best handheld running water bottle and a few reviews to help you get started with your search. Click Here for the Best Water Bottles Available for Runners in 2017! If you aren’t sure how much fluid you will need or want to consume in an hour, it’s not a bad idea to go for a run and start on the low end and see if that is enough, or if you will require more. This will give you an idea of what size bottle you will need on your runs. Most bottles will hold between 10 and 24 ounces, but if you need more you might want to look at a hydration pack or a water bladder. The first size bottle you should try is a ten-ounce bottle to help you get used to it. Go for short runs at first when you start carrying your water bottle. Basically, a distance where it won’t be necessary to need hydration, so it won’t ruin the experience. After you get used to carrying the 10 ounces for a while, you should upgrade to a larger bottle that can hold more water. Instead of taking in large amounts of water all at once, only sip fluid every five to ten minutes or so. It also helps to know where water fountains or cafes are along your route to help you with refills. At this point, you also want to decide if you want to carry any other items like your keys, ID, or phone along with your bottle. One other thing to consider is to hold the empty bottle in your hand before trying it on a run, that way if it annoys you immediately, you will know it won’t get any more comfortable when it is full. The type of water bottle will vary in size and different features like the nozzle. Depending on how far you run, you want to make sure your water bottle is large enough to carry an adequate water supply, so you don’t run out too soon. A good rule of thumb is one liter, or 33 ounces, of water per hour that you are running. Also, check out the nozzle of the water bottle to make sure it won’t leak or isn’t too difficult to open while you are running, so you don’t have to stop when you need to hydrate. Will you need extra storage for your keys, ID, or cash? Depending on what you carry with you when you run, you want to look for a water bottle pack that will be able to accommodate a few items. Other water bottles don’t have any storage and some even have a place for your cell phone. Depending on how much you sweat, you need to check out the grip on the water bottle. If it has a mesh grip, it will help to keep your hands cool if you sweat a lot from your hands. If you don’t, then a regular grip will be fine, especially if you run in colder climates. If you are used to doing a decent five to ten-mile run, the Quick Grip Chill™ has the volume you need for a long run, plus it is portable and easy to use. Along with the water bottle, there is a zippered pouch that has enough room for your phone, keys, and ID. If you want to take along an energy gel, there is a mesh pouch that is expandable, plus a velvetex-lined strap that won’t cause chafing on the long runs. Your drink will remain cold for the entire run with the insulated Podium bottle which is twice as long as its competitors will keep it cole. It also features jet valve seals to stop leaks while you are running and reflectivity for your evening and early morning runs. Other features include a key clip and a cinch strap that is adjustable for secure carry. The patented TruTaste technology of the Camelbak will keep your water tasting clean while the new Quick Grip with 21 Chill Jacket insulates the bottle so the water stays cool and refreshing. 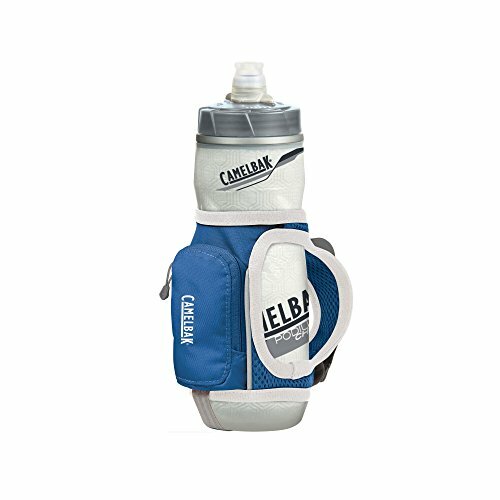 Camelbak is the bottle that started it all and it continues to rule the hard sided bottle market. Here are a few pros and cons. Nothing is worse than getting the wrong bottle for your long runs. The Nathan QuickDraw Plus let you enjoy all the hassle-free features without having to deal with a hydration belt for running. This handheld bottle can store 22 ounces of water, is BPA-free, and both the bottle and caps are dishwasher-safe. It also comes in a variety of color including Red, Blue, Black, Pink, Gray, Purple, and Green. The Nathan QuickDraw Plus features large pockets to store necessary personal items like keys, ID, and cell phone. This bottle is not only good for runners, but as a workout accessory for anyone. The bottle is easy to wash and dry, and an air mesh hand strap wicks away moisture. It has a totally adjustable hand strap with a thumbhole feature allowing you the mobility to run or walk with it and not even realize you are holding it. The thumbhole also lets you hold the water bottle in several different ways, so your workout can be completely grip-free. The QuickDraw is a durable and efficient product that gives you easy drinking access with its leak-free Tru-flex bottle that gives you a soft sip with a cap that has a push-pull feature. Let’s check out the pros and cons. For an ergonomic and innovate design, the Salomon Park Hydro Handset is a stretch carrying system with a compressible 500 ml flask that also includes a small external pocket. This is a convenient and versatile water bottle that gives you constant and convenient water delivery, so you can stay hydrated during long runs. It has an elegant and simple solution to your water needs that includes fabric that wicks away moisture with an elastic and breathable mesh that encourages sweat away from your body giving you a cool and dry handset. It also features a mix of pouches and pockets that give you additional storage space for personal items like phones, keys, and cash. The included 500 ml bottle releases fluid at a high rate while its reflective accents promote safety for nighttime and early morning runs. The Park Hydro will fit easily in your hand and the soft flask will compress as you drink. 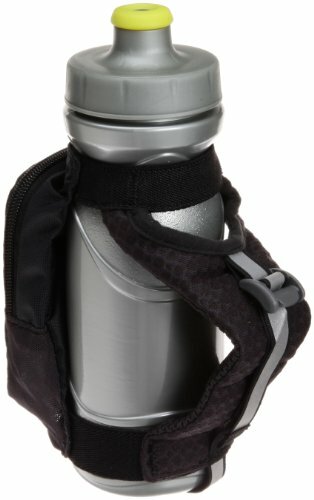 It also includes one mobile phone pocket with a stretch carrying system and the flask compresses as you drink. Here are a few pros and cons of the Park Hydro. 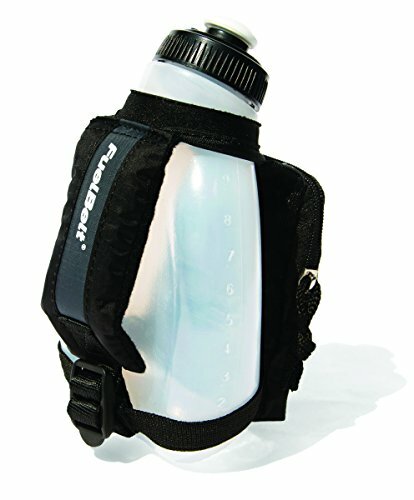 Perfect for short runs or in between water stations in a race, the FuelBelt Sprint Palm Holder holds ten ounces of water in an ergonomic bottle that will fit perfectly into the contour of your hand. The small pocket with a zipper will fit a few gels, or your ID and keys. It features an updated P2 cap that has a soft silicone push-pull nozzle that is easy to use and has improved leak protections. The FuelBelt Sprint has a totally adjustable hand strap that is padded for comfort. It is very durable and lightweight made of 700 D ripstop materials and the included bottle is dishwasher safe and BPA free. Let’s check out some of the pros and cons of the FuelBelt Sprint Palm Holder. Nalgene’s classic neoprene sleeve will fit nice and snug around a 32-ounce bottle keeping your water at a nice cool and refreshing temperature for longer. The bottle is BPA free and is made of the finest metals and plastics. The Nalgene Handheld is good for both indoor and outdoor use and fits all 32-ounce wide-mouth bottles. The Nalgene Handheld not only looks good, but is an innovated water carrying solution that can be used while you are running or walking. It attached securely to your pack or belt with a zippered pocket to carry your ID and keys. 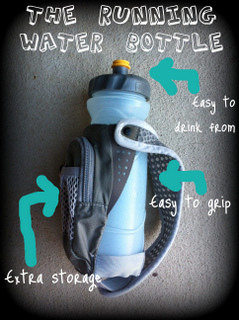 Here are a few pros and cons of the Nalgene’s Handheld Water Bottle Sleeve. 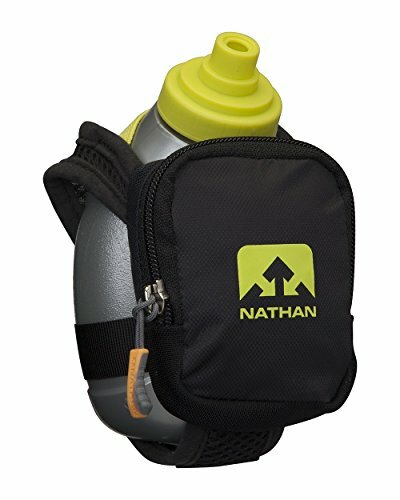 The Nathan Quick Shot is perfect for those short runs when you don’t want the added weight of a large and awkward water bottle and a hydration pack that is going to bounce on you. The lightweight Nathan Quick shot is easy to carry and has on-the-go storage for those small necessities you want to take with you like your ID, keys, and cash. This is a good bottle that does its job without getting in your way, and if you are going out for a longer run or the day is hotter than expected, it is easy to grab a second bottle so you have one for each hand. It is made of low-density polyethylene that is BPA free, and it comes with a completely adjustable hand strap that features a thumbhole for increased comfort that is grip free while you are running. So, what are the pros and cons of the Nathan Men’s Quick Shot. Volume – consider how much it will hold. Portability – think about where you will be running and if it will weight you down if it is heavy and awkward. Durability – if you are an avid runner, you will want to make sure you have a bottle that will last awhile, and that you have something that will survive being dropped. Ease of Use – depending on the opening of the water bottle, some are easier to use than other. This can also be a personal preference. Some bottles have straws for those that like tilt-less sipping, and some have a smaller opening to lessen spilling while large openings allow you to add ice and makes cleaning easier. 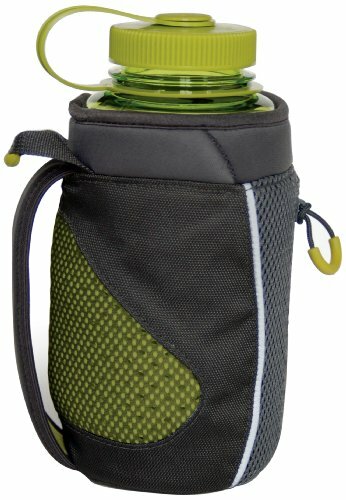 Versatility – is this a multipurpose bottle and are there different ways to carry it. Finding the best handheld water bottle for running shouldn’t be too difficult with all the great products on the market for runners. You want to find one that has the best innovations including moisture wicking, non-leaky valves, and convenient pouches for personal items. Once you have found the best one for your needs, you will be ready to hit the trails running! Next Article Should You Use Creatine While Cutting?